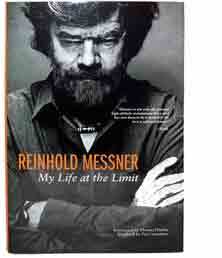 Reinhold Messner is one of the few – if not the – most accomplished mountaineers of our time. I ran into Messner briefly in 1997 when I was staying at Khan Tengri base camp in Central Asia. He was camping nearby while researching a book. Starstruck, I dared to ask him for his autograph on the only piece of paper I had, a postcard. He gruffly agreed, but I could tell he wasn’t pleased. A couple of years ago, when this book was first published, he spoke in Seattle and was utterly charming. My Life at the Limit is a fascinating account of his adventures, told in a question-and-answer format, not unlike the style that’s so popular with online communications today.